These Crisps managed to muster crunchy, crisp and meaty very well. The first bite was hard and almost brittle as it splintered under the weight of the munch. The degradation that followed was even and fair until the end when a final mouthful featured a gentle mush. Although there were some characterful bends and curls, these were flatter than many in Tyrrell’s range. There were oil boils and they were also thickly cut, but the most stand-out feature was an uneven, but thick coating of seasoning. There were green flecks, and a powder that was sort of orange in colour, but it blended well with the natural yellow of the Crisp. Nose Plunge Tests are often an unreliable indicator towards the flavour of Crisps. However, these got off to a particularly good start. There was a hint of Garlic and even the slightest whiff of cooked Lobster. There was certainly a fishy sort of flavouring and this was backed up with Garlic which added a creamy background to the flavouring. Some Crisps blend the flavours in a combo, these fascinating Crisps managed to keep each individual contributor separate because there was even a little spicy kick. 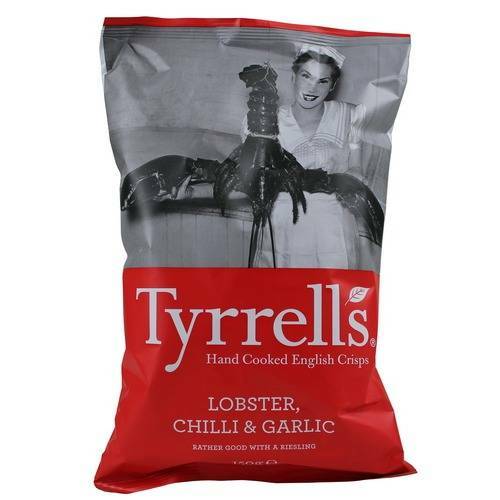 While we would not automatically claim the taste of the sea was Lobster, the overall effect of the flavour was impressive and a massive leap forward from the traditional British Prawn Cocktail option.